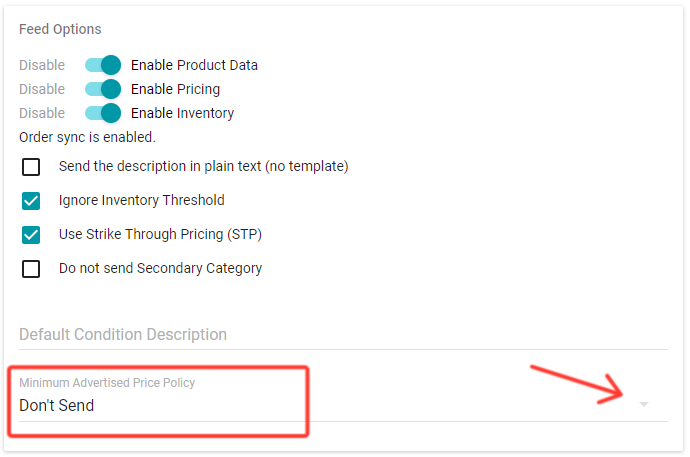 Zentail implements MAP (Minimum Advertised Pricing) if your Item Price is less than your MAP Price and your Integration settings are configured as shown below. This means your listings will display "Add to cart to see price" or "See price in cart" instead of your below-MAP pricing. Please note that Zentail does not control how the channel (i.e. Amazon, eBay) decides to display your below-MAP pricing and this may not work as intended for all products if you do not have competitive pricing or brand registry. Go to the Amazon section of your Integrations page. Go to the eBay section of your Integrations page. Scroll down to the Feed Options section. In the field for Minimum Advertised Price Policy use the drop down menu to change from "Don't Send" by choosing "Show in Cart" or "Show at Checkout". Jet.com MAP can be implemented on a per-SKU basis. Please follow this guide for Jet.com MAP implementation.